A windmill near Zaandam painted in 1871 by Claude Monet. Zaandam (Dutch pronunciation: [zaːndɑm]) is a town in the Netherlands, in the province of North Holland. It is the main city of the municipality of Zaanstad, and received city rights in 1811. It is located on the Zaan, close to the North Sea Canal, and is close to Amsterdam. Zaandam was a separate municipality until 1974, when it became a part of the new municipality of Zaanstad. Zaandam, c. 1889. Etching by James McNeill Whistler. Zaandam (formerly called Saenredam) and the surrounding Zaan River region, called the Zaanstreek, have a history that is intimately connected with industry. In the Golden Age, Zaandam served as a large milling center. Thousands of windmills powered saws that were processing Scandinavian wood for the shipbuilding and paper industries. A statue was commissioned from the Yugoslav sculptor Slavomir Miletić in honor of this era, and the statue, “The Woodworker” (“De Houtwerker”), was installed on 20 June 2004. Zaandam was a leading city in the first Industrial Revolution. Into the second half of the 20th century, Zaandam was still an important lumber port. Zaandam is also historically linked with the whaling industry. In 1697 the czar Peter I of Russia spent some time in Zaandam, studying shipbuilding. The house where he stayed is preserved as a museum, the Czar Peter House. In 1871 the impressionist painter Claude Monet painted several pictures of the area, including Bateaux en Hollande pres de Zaandam and A windmill at Zaandam. The first European McDonald's restaurant opened in 1971 in Zaandam. The Albert Heijn supermarket chain is also headquartered in Zaandam, where it originated. Also the Dutch soccer club AZ (Alkmaar Zaanstreek-combinatie) was founded in Zaandam. May the 10th, 1967. 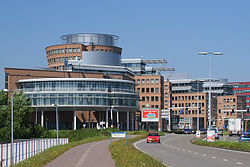 Albert Heijn headquarters in Zaandam, the Netherlands. ^ Statistics Netherlands (CBS), Statline: Kerncijfers wijken en buurten 2003-2005 . As of 1 January 2005. J. Kuyper, Gemeente Atlas van Nederland, 1865-1870, "Zaandam". Map of the former municipality, around 1868. This page uses content from the English language Wikipedia. The original content was at Zaandam. The list of authors can be seen in the page history. As with this Familypedia wiki, the content of Wikipedia is available under the Creative Commons License.